We offer FREE FREIGHT to mainland Australia on ALL orders over $30.00. 303 Protectant conditions beautifully and prevents fading & cracking. We recommend only 30..
• 5 scents; Wild Berry, French Vanilla, Cool Mint, Summer Melon, Lavender • Simply place disposable..
Enviro Booster Comes in three sizes; 250Kg $35.00 - 500Kg $55.00 - 1kg $75.00 and 2kg $95..
Enviro Clarifier Comes in three sizes; 250ml $35.00 - 500ml $55.00 - 1Lt $75.00..
Enviro pH Raiser Comes in three sizes; 250kg $15.00 - 500kg $20.00..
Enviro Sanitiser Comes in three sizes; 250ml $35.00 - 500ml $55.00 - 1Lt $75.00.. 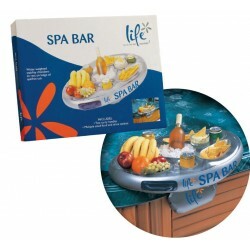 Floating Spa Bar – Life • Inflatable spa caddy • Includes multiple food and drink cavities • Fe.. Please enquire on any filters required..
Spa Booster Seat – Life • Comfortable and attractive design • Firmness and size can be adjusted ..
Spa Pad – spa cleaning pad made from crushed walnut shells – gentle yet strong enough to remove heav..
Spa Pillow • The perfect relaxation accessory • Quality suede mater..
Test and monitor the water quality of your spa. ..